1. Go to Pages → Add new. Create a new page named “Social connect”. 2. 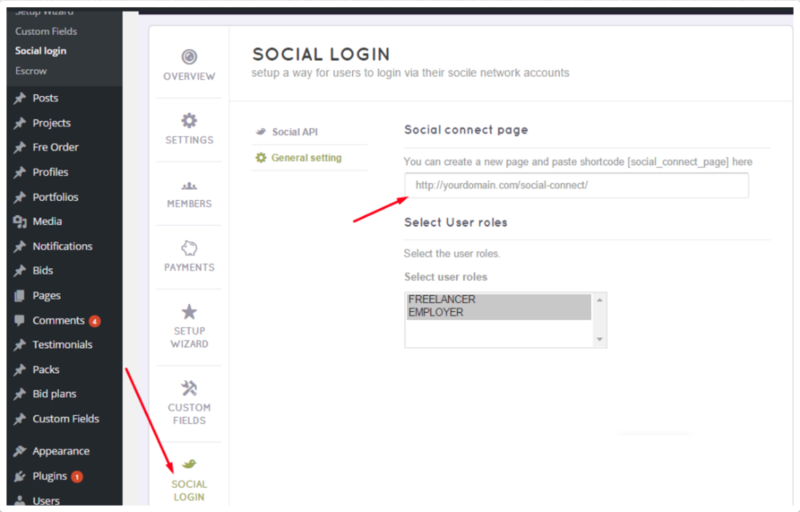 Choose Engine settings→ Social login→ Social API: Insert the API in each Social API section. In the General setting: Paste the link of the “ Social connect page” you've just created above. Then, select the Users roles. 3. After that, you will be prompted to a screen where you can create a new Facebook app. Please click “Create App ID” button. 5. At that time, you will be redirected to the product setup page, please click “Get Started” button in the Facebook Login section. 7. After that, you need to input your Site URL and click the “Save” button. Please note that this URL includes http:// or https://. 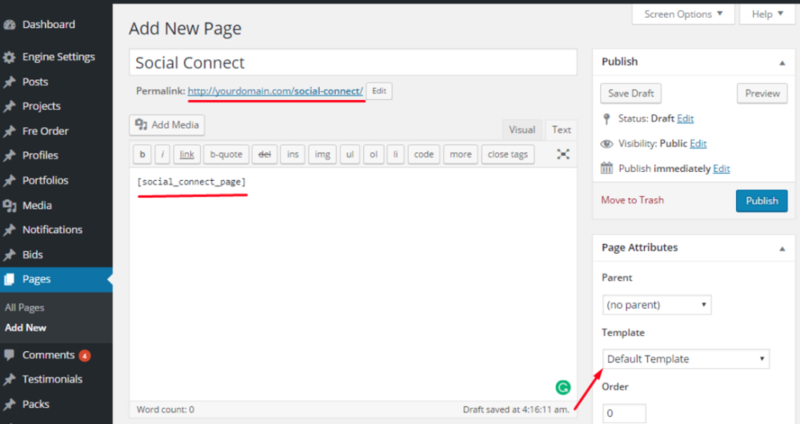 EngineThemes will enter https://www.enginethemes.com if we wish to use this feature for our site for example. Enter your website domain in the App Domains field. For example, if your site URL is www.enginethemes.com or enginethemes.com, you must to add www.enginethemes.com or enginethemes.com in this field. 10 In the App Reviews section, click the button to the right of your app’s name to make your app be public. If you see the green dot – that means your app is online. Now your customers could log in using Facebook login. 11. Finally, go to your app’s dashboard and copy your Facebook API data and add it in Engine Settings → Settings → Socials. 3. Get Consumer key and Consumer secret on your Application settings. 6. Add Co nsumer key and Consumer secret to your site. It locates at Engine Settings → Settings → Socials. 4. Select Credentials tab under “API Manager” section in the left sidebar. In this step, you must fill all required fields as instructed, then click on the " Save" button to submit. 7. On the next screen, you must select Other as your application type. Then, click on the “Create” button. 8. After that, you copy the Client ID, Client secret from the QAuth client dialog box to your site. It locates at Engine Settings → Settings → Socials. JobEngine & FreelanceEngine theme support importing user information from LinkedIn to your job seekers’ profile. You only need to register one LinkedIn API Key to set the system working. 1. Create a LinkedIn API application at https://www.linkedin.com/secure/developer?newapp= . 2. Click the “ Create Application” button. Company Name: Specify your company name. Name: Specify the name of your app (You can type whatever name you wish , but it’s recommended to enter your website or company name in this field). Description: Enter short description of your company/website. Application Logo URL: https URL of the logo of your company/website, in PNG or JPG format (preferably 80×80 pixels). Website URL: Go to your website homepage, copy this URL and paste it in this option. Please make sure that this URL includes http:// or https:// (for example: http://mywebsite.com orhttp://www.mywebsite.com). Business Email: Specify email address. Business Phone: Specify your contact number. Then, click the “ Submit” button to complete. 4. Make sure r_basicprofile , r_emailaddress are selected in Default Application Permissions section. Fill the blanks. Next, click “Update” button on LinkedIn app page. ***Notice: In the Authorized redirect URIs field, you must enter this default URL: https://yourdomain.com/?action=linked_auth_callback. EngineThemes will enter http://enginethemes.com/?action=linked_auth_callback for example. 5. Navigate to Settings section from the left sidebar. Set Application Status to Live and click “Update” button. 7. After the page refresh, you should see the domain (you have just saved) below the option. Click “ Update” button. 8. Copy Client ID and Client Secret to your site (Engine Settings → Settings → Socials).